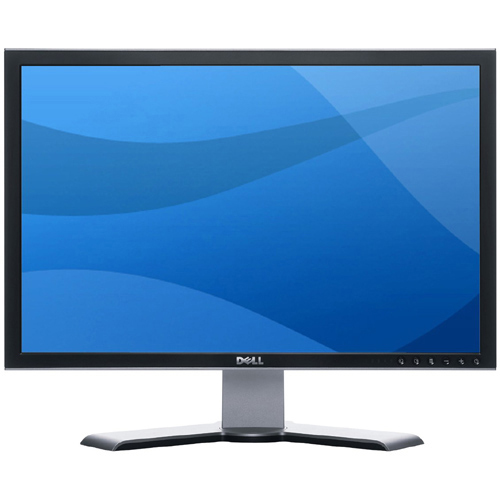 Dell 2407WFP is a 24″ UltraSharp wide screen flat panel LCD monitor that replacing the Dell UltraSharp 2405FPW. Dell 2407WFP with 24-inch diagonal size features wide aspect ratio Active Matrix TFT LCD flat planet display which supports High Definition (HD) 16.7 million colors at WUXGA resolution (1920×1200), 100 mm VESA Mount Compatible, integrated 9-in-2 media card reader and slots, Picture In Picture, Picture By Picture, includes Height Adjustable Stand, 16 ms typical (black to white) and 6 ms typical (gray to gray) response time, 5.1 inches (130 mm) of height adjustment, image contrast ratio of 1000:1, image brightness of 450 cd/m², image viewing angle of about 89° and comes with USB 2.0, analog, DVI-D, S-Video, composite, component connectors and ports. The big LCD monitor weighs about 14.31 lbs. ZDnet (link dead) gives excellent editors’ rating of 8 out of 10 with comment that Dell’s 24-inch wide-screen LCD delivers excellent image quality and a ton of connectivity options, including video inputs and picture-in-picture settings. Add in a great price, and the Dell UltraSharp 2407WFP is the best value in its class. PC Pro gives 6 stars out of possible 6 to the ultra large Dell LCD and concludes that it’s an update to the 2405FPW, now HDCP compliant and with vastly improved styling at no extra cost – simply stunning. The most noticeable change over the 2405FPW is in the looks: with its silver back panel and attractive stand design, the 2407WFP has genuine style to match its features. Incredibly, it costs under £600. It will take something special to oust it from the A List. CNet reviews Dell UltraSharp 2407WFP and concludes with excellent rating of 8.0 out of possible 10 that Dell’s 24-inch wide-screen LCD delivers excellent image quality and a ton of connectivity options, including video inputs and picture-in-picture settings. Add in a great price, and the Dell UltraSharp 2407WFP is the best value in its class.